Cadet Casey Toavs receives his first set of wings from Maj. Michael Allen upon graduating from the Air Force Junior ROTC Flight Academy. 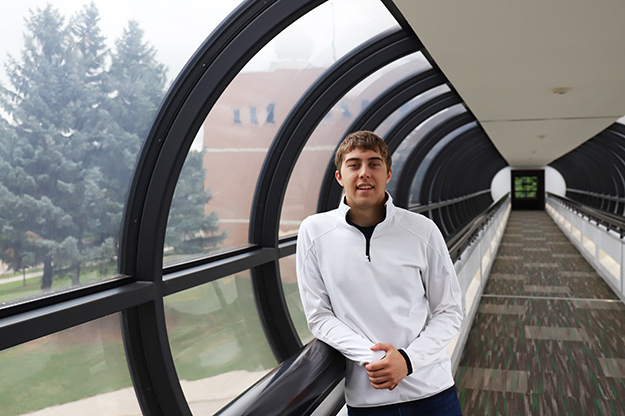 He and nine other cadets spent their summer at UND earning their private pilot’s license. Photo by Connor Murphy/ UND Today. In Keizer, Ore., Casey Toavs was an active member in his high school’s Junior Reserve Officer Training Corps since freshman year. He knew it would help his goal of joining the U.S. Air Force. When he saw the chance to earn his private pilot’s license, before the next step of his education, he knew he had to apply. “The opportunity was there, to get ahead of the curve,” said Toavs. 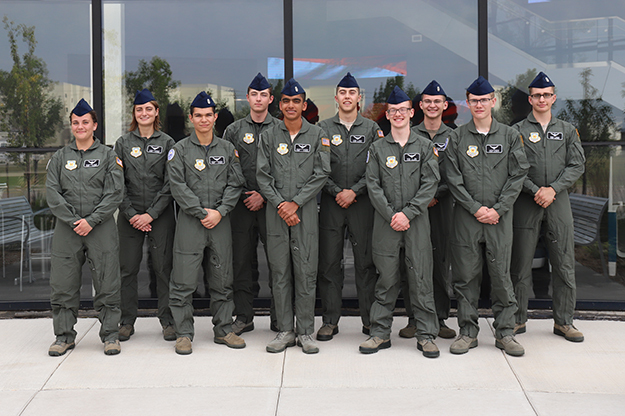 Toavs is one of 10 students at UND this summer who completed their private pilot’s license as part of the Air Force Junior ROTC (AFJROTC) Flight Academy – a pilot program seeking to address a looming, nationwide shortage. 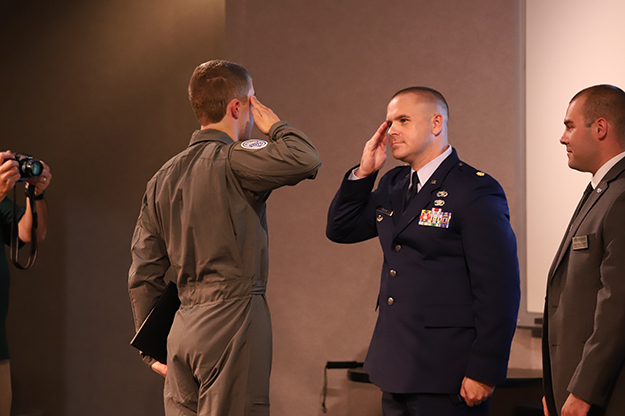 Last Thursday, cadets received their own set of wings at a ceremony recognizing their achievement. The AFJROTC’s Region Director, retired Col. Ben Young, gave his remarks and showed his gratitude for the program’s success. 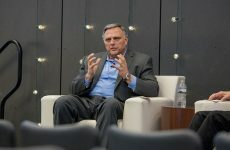 Beth Bjerke, associate dean at the John D. Odegard School of Aerospace Sciences, says the University has had a close relationship with the Air Force for years when it comes to tackling the pilot supply issue. 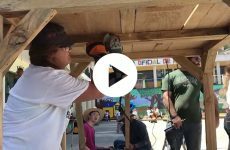 “We’ve studied it since 2009, understand it and want to be part of the solution,” she said. UND was selected among five other aviation schools to accommodate 120 cadets through its nine-week inaugural run. Each cadet’s tuition, room and board, flight fees and supplies are covered by the unique scholarship. Nine weeks to complete a private pilot’s license is no small feat. Typically, students can carry over at the end of a course term to finish flying hours and other necessary requirements. This summer’s group, with five of the 10 returning home to finish their senior year of high school, flew six days a week and attended class Monday through Thursday. When Toavs spoke with UND Today, he only had a week and change left to complete a solo, cross-country flight and a final checkride to earn his license. Toavs says he likes how the program works at UND. He enjoys working with the aircraft and airport facilities, particularly the certified flight instructors who get students like Toavs in the air. Joubert says they also demonstrated a high level of motivation and passion, which helped them “soar” through their training and coursework. The cadets came from around the country for a unique experience at UND. The large number of high school students involved in AFJROTC inspired the Air Force to address a looming pilot shortage through a scholarship opportunity. Photo by Connor Murphy/UND Today. Cadets were enrolled in a five-credit private pilot course typically offered by the University. Due to current student capacities, Bjerke says the school was unable to accommodate more than 10 cadets, despite the Air Force’s desire to eventually provide scholarships to 1,200 cadets a year. Six-hundred thousand students around the country are involved with AFJROTC. The Air Force says experts project a demand for 117,000 new commercial pilots over the next 20 years; and the military branch is currently short 1,500 pilots. UND has been a part of a national pilot shortage forum, says Bjerke, that’s made up of industry, military and academic actors. Of the 600,000 enrolled AFJROTC cadets, close to 40 percent are female and around the same percentage represent a minority population. Toavs is moving from Keizer, Ore. to attend UND this fall. This summer has given him a head start on exploring campus and getting to know the flight school. Photo by Connor Murphy/UND Today. Toavs felt “pretty good” about being selected among 800 applicants. Also, being sent to UND for the scholarship gives him a better feel for the college he’ll attend this fall. He started considering the move to North Dakota after a friend recommended checking it out. He’s excited to see what UND Hockey is all about, and to explore more of campus and Grand Forks. With his goal of being a pilot in the Air Force, he’s also looking forward to the collegiate ROTC experience. 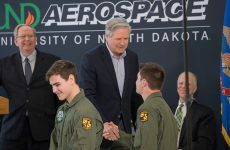 Throughout the program, cadets were able to see other aspects of the UND aerospace environment. This included a trip to Grand Forks Air Force Base and the Space Studies Department’s Human Spaceflight Laboratory. Friday Fundays, Bjerke calls them. Toavs enjoyed being able to see what else is out there, in fields related to aviation. Cadets also got a feel for living on a college campus. They shared a wing of a residence hall for the summer, to which Bjerke credited UND’s staff for a quick turnaround in providing housing.